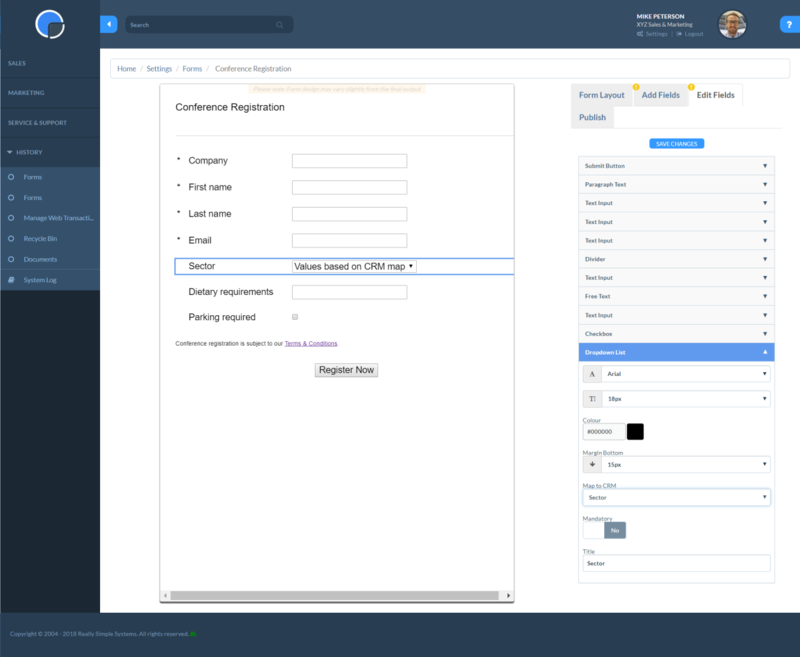 The Web Forms feature lets you capture new leads online and add them automatically to your CRM. 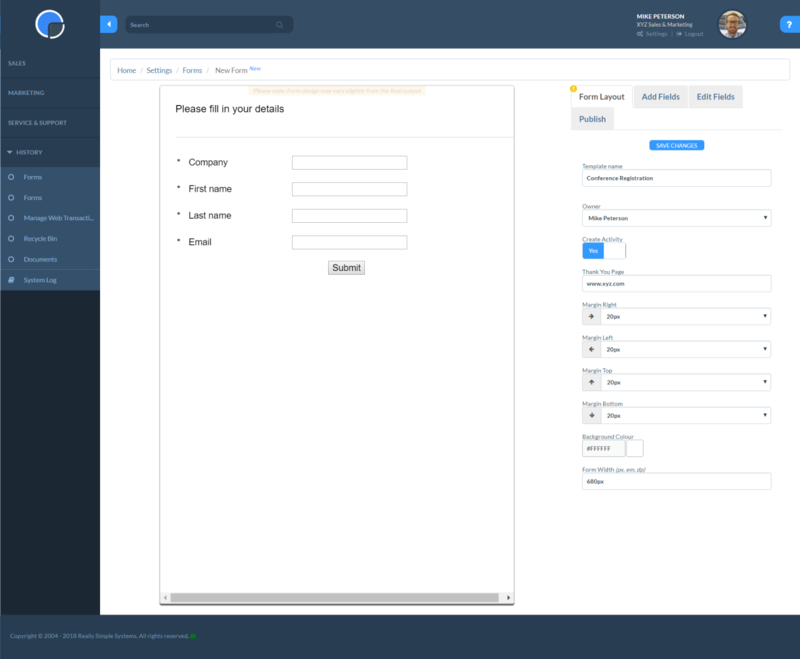 You can design a Web Form in the CRM and add the code to your web site. 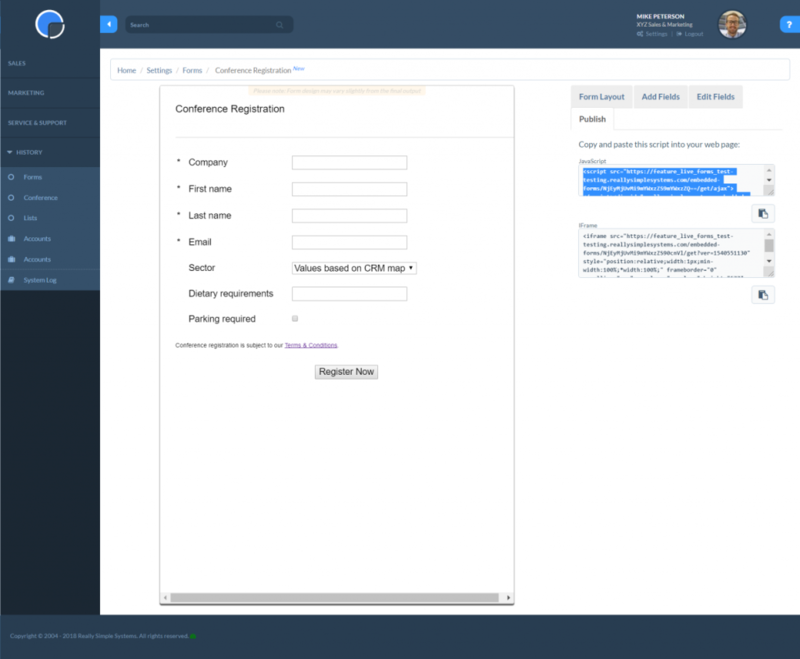 Contacts entering their details to the Web Form will be automatically added to your CRM. Web Forms work by automatically setting up a Web Transaction that will create a new Company Account, Contact and Actvity when the form is submitted online. Each Web Transaction can include multiple actions to process the data of your new inquiry. So, as well as creating an Account you can edit the Web Transaction to trigger a Task, or a new Opportunity. Web Forms is included in the Advanced Marketing module available on the Professional and Enterprise plans. 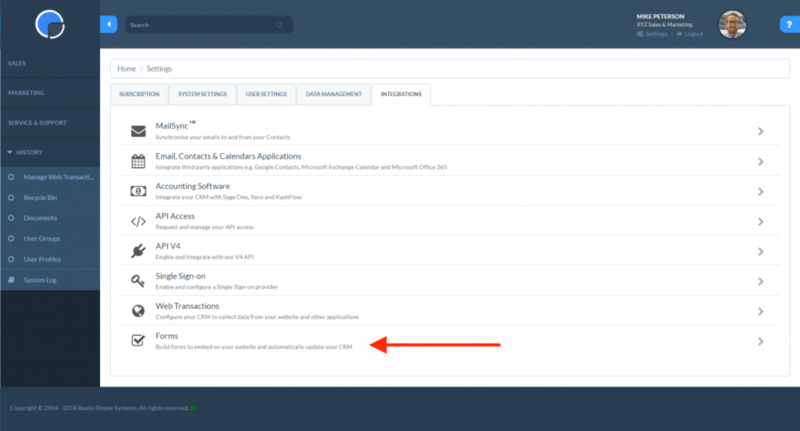 To create a Web Form, in your CRM go to Settings, then Integrations and open Forms. At first the page will be blank, so click ‘+ Add’ to create a new form. Clicking ‘+ Add’ will open a new form with a standard form template that you can use or edit as you wish. On the Form Layout tab you’ll see options to edit the layout of your form. This includes your form name, owner, margins, form width and background colour, which you can edit as required. You have the option to Create an Activity in the Account record when a contact completes the form, by setting the toggle button to “Yes”. In the “Thank You Page” box you can add your own thank you message or add a web page URL. When the contact submits the form they will be taken to your Thank You Page. Once you have finished editing the layout click “Save Changes”. There are six different field types that you can use in your web forms and these can be matched to the data fields in your CRM. You can add these to your form by dragging and dropping them to the layout screen. You can remove any unwanted fields by dragging them over the “Trash” icon and releasing. Text Input lets you add a field to the form where the data will be added to the appropriate field in the Account or Contact record of the CRM. For example, the Name, Address, Telephone Number or Email Address. Dropdown List lets you add fields that are controlled by dropdown lists in your CRM. For example, Sector, Account Type or Country. Checkbox lets you add fields to your form that are shown as a checkbox on your CRM. For example, Decision Maker, Hold or a custom field you have created. Free Text lets you add a paragraph of text to the form. You might use this to add instructions on completing the form or maybe include a link to your terms and conditions. Divider gives you the option to add dividers to the form. Should you wish to create a space rather than use a divider you can do this by changing the divider colour to the same as your form background. Submit Button adds a button to the form that when clicked submits the data to the CRM. You can edit the button wording as required. Once you have finished editing click “Save Changes”. The Edit Fields tab lets you edit each field on your form and map it to your CRM. You can edit the field title, font style, font size, colour and margin. You can also set a minimum or maximum number of characters that can be entered in the field and select whether the field is mandatory or not. 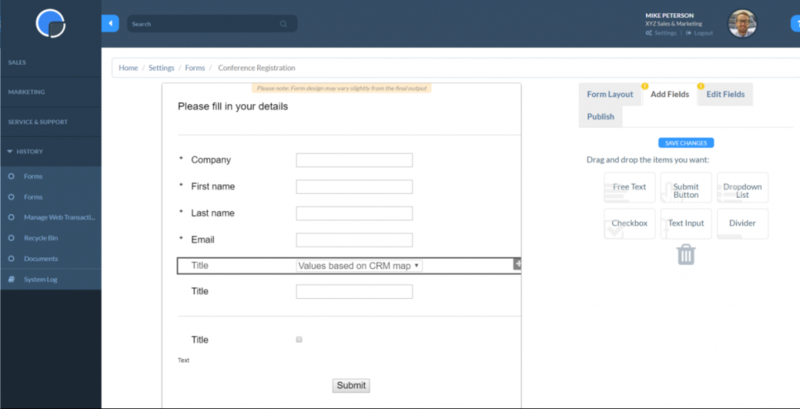 To map the field your CRM, in the “Map to CRM” box , use the dropdown list to select the CRM field that your form field relates to. For example, Contact First Name, Contact Last Name or Email. N.B. The form will pick up any pre-set styling in your website. Please consult with your web developer if you want to override these settings. When you put your web page live, you will see your web form. When your contact completes the form their details will be added to your CRM. 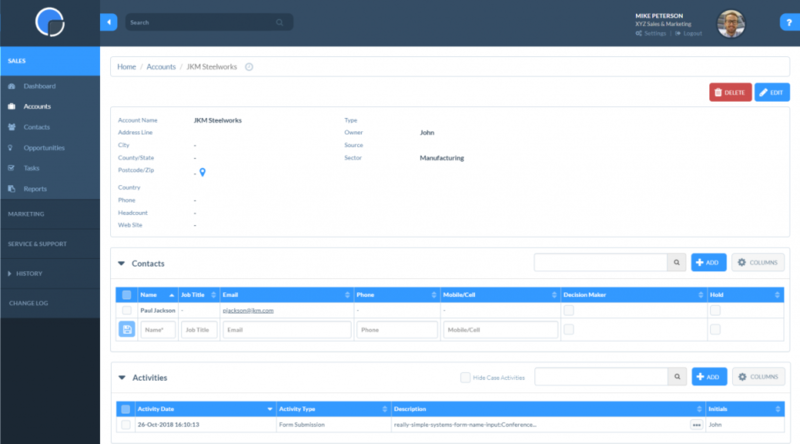 Going to your CRM, you will see that the new Contact has been added to your Accounts. When you open the Account you will see that a record of the transaction has been added to Activities.